On June 2nd and June 5th, within the hallowed halls of the NTRPG Con (North Texas Role-Playing Games Convention), DARLENE will take exceptional individuals (who have signed up) on a journey through the Mid-Realm via her 1980s JASMINE: The Battle for the Mid-Realm card game. There can be only one victor. Within the Mid-Realm lies four Kingdoms. The rulers of each kingdom have different strengths and weaknesses depending upon their nature. 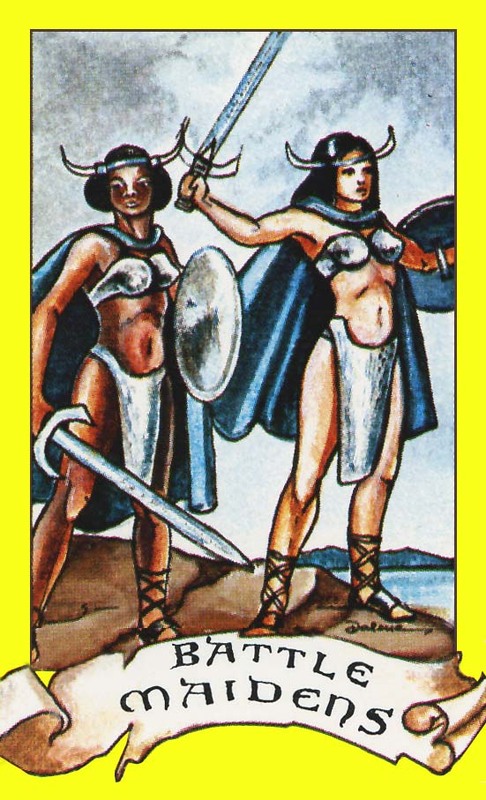 The experience of playing JASMINE: the Battle for the Mid-Realm collector card game differs depending upon the faction played. BLUE FACTION TARRANT is a very large kingdom on the tundra in the northern most regions of the Mid-Realm. It is ruled by Thorgall, a cold-hearted man who has built a tremendous fortress of ice and snow. Thorgall regards all other factions with cool indifference, secure in knowing the icy reaches would claim any of their armies long before any weapon could. Thorgall lives in a crystalline ice palace, deeply immersed in the secret which keeps his icy kingdom intact. RED FACTION A very different Kingdom lying in the Mid-Realm’s west is ruled by the ruthless Queen of Fire, Melantha. She is effective because she knows the value of infinite patience. As silently as a spider, Melantha weaved a powerful web so she can study her enemies and identify their weaknesses. Her magic is strong, but her armies are weak. She may have plenty of demon minions, but they are of little use in battlefield fighting. Besides relying on her magical skills, Melantha also schemes, such as making alliances to have someone else eliminate a mutual enemy. Her Castle Ildshoii was built within the side of a volcano. PURPLE FACTION Like the fire queen, Bardulf, the dark prince, knows how to use cunning and guile to attain land and privilege. He has already stolen Jasmine’s ancestral kingdom of UR and rules it from his Castle Swartzborg which lies to the East. Bardulf has been to known to dabble in the practice of magic, which luckily granted him the protection of a powerful dragon called Gryth. But he much prefers stealth to being on the open battlefield. His armies consist of spys and assassins who work behind the scenes to obtain control for their master. YELLOW FACTION Jasmine, along with her father the king, have lost the Kingdom of UR. She escaped Bardulf’s abduction attempt and has made her hiding place within the crystal caverns her Castle. To survive, the princess has had to quickly learn the power of diplomacy and rediscover her enormous aptitude for magic. Now she’s at the point where she can boast alliances between the Dwarves, Battle Maidens, Mounted Warriors who, all together, have impressive fighting skills. They perform their best when Jasmine or their own leaders are with them. Battle Maidens within Jasmine’s Faction. GREEN FACTION The King of UR (along with his army of mercenaries) and the Nomadic Barbarians will also add their strength in battle to any faction who successfully negotiates with them. When the game gets started and the factions mix it up, interesting things happen. Then, for a completely different gaming experience, switch factions! This entry was posted in Jasmine & Role Playing Games, Recent Events and tagged 1980s card game, card game, fantasy card game, Jasmine card game, Jasmine Game, NTRPG on May 28, 2016 by Darlene. Mab and I want to play in a session sometime when I’m not committed to running my own events! I’ll check the schedules and make plans…. I think it was GenCon XV in 1982 when I discovered this game. I was a goofy teenager hosting an original D&D adventure called “Realm of Keraptis”. When I received the schedule and instructions in the mail (snail mail!) I saw that Darlene would be there. I grabbed my copy of Dragon #37 and faithfully brought it to her for an autograph, which she was more than happy to sign. It was such a wonderful experience at GenCon, and I obtained a deck of Jasmine cards before the end of the convention. My friends and I played a LOT of this cardgame through high school. One day I n art class I created my own expansion pack of two new factions so more of us could play at a time. Even after I grew up and went overseas, I brought my cards to play wherever I went. Since then, life has taken me around the world dozens of times, landing me in Europe, Africa and the Middle East. I finally plopped down here in the USA again and notice that I lost my Jasmine cards somewhere along the way. And now Darlene is sending me a new set. Many many thanks!!! !